Doctor Who fans will soon be angrily explaining (again) that their phone booth came first. Alex Winter - Bill - has confirmed a rumor that the Bill and Ted series is going to become a trilogy. Let's face it; it was only a matter of time once skinny jeans and off-the-shoulder shirts came back into fashion. Bill and Ted, of Bill and Ted's Excellent Adventure and Bill and Ted's Bogus Journey are going to add another movie full of faux southern California slang and air guitar. I'm not worried that it's going to be dated. It will be. If it wasn't dated when it came out, it most certainly was by the time Bogus Journey got to VHS. Bill and Ted were basically a hair band with short hair. Alternative rock chewed that sound up and spit it out. It was like Saturday Night Fever, looking at a nearly dead culture. So no, I'm not worried that it's going to be dated. I'm worried that it's going to be sad. 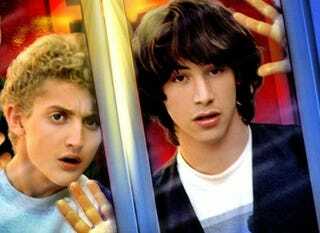 Bill and Ted were supposed to start their meteoric rise to fame in 1991, and a utopian society was going to follow. It'll be twenty years. What the hell happened? It was all part of The Matrix? According to Winters, they've found a way around it. "We kicked around the idea over the years and had always thought if we could make something that was as kind of genuine in spirit as the originals and without falling prey to kind of retro cynicism or something that was unnecessary, it would be worth doing. Now the cat's out of the bag, and the truth is that, yeah, we have finally hit upon an idea that we think is pretty great. We've been working on it for the past couple of years, honing that idea and getting it into shape." At this point, there's no projected date for this game-changing idea to arrive in theaters. I guess we'll just have to wait. And yes, Keanu will be in it. Find out more at the MTV movies blog.